In politics, as you likely know, the expression “cheap tricks” has a negative connotation. For teachers, on the other hand, the word cheap usually means affordable. Educators struggle with budgets year in and year out; finding cheap, that is…inexpensive…tools to catch and keep kids’ attention is a good thing! One way to create attention-ology tricks “on the cheap” is to transform ordinary, dollar-store objects into eye, ear, heart and mind-catching tools. Shop here for some that your students will love, especially as the school year draws to a close, at least for those on a traditional calendar. The “cheap” stuff is capitalized below. Colorful STICKY NOTES are multi-functional! Another STICKY NOTE option is to post a sign, like the one in my blog pic, on a bulletin board surrounded by notes that students can pick off and take to their desks. Asking kids to “help the puppies pass their test” essentially turns your class into an imaginary “training team,” where the trainers themselves succeed! in a basket next to a ceramic PIGGY BANK like the one in my blog pic here. Encourage your class to jot down ideas for maintaining focus during lesson time. Offer an incentive for participation such as a new pencil for anyone who drops an idea slip into the PIGGY BANK with their name on the back. 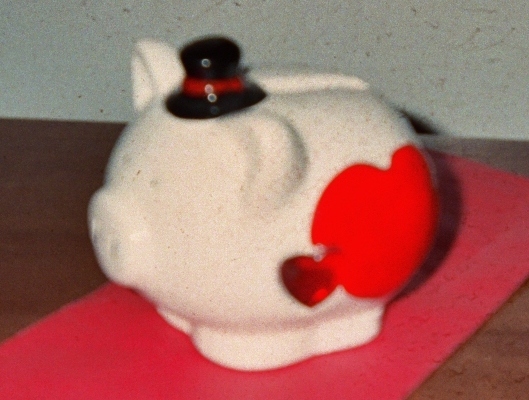 I chose the bank you see here because of the bright red heart on the pig’s side. I tell kids that my PIG “loves attention… and…kids who pay attention in class.” PIGGY BANKING good ideas for keeping your class on task is easily as valuable as saving coins; do you agree? Make Transition Music with MARACAS – Any Pre-K – 5 teacher knows that the school day is packed “to the gills!” Yikes! Some days leave us with a sense that our heads are spinning. No wonder we need “cheap” easy-to-use attention-ology tools. One of the trickiest challenges is to not lose too much time transitioning from one activity to another in class or on the way to “specials,” like Music. Why not use music to help make transitions! 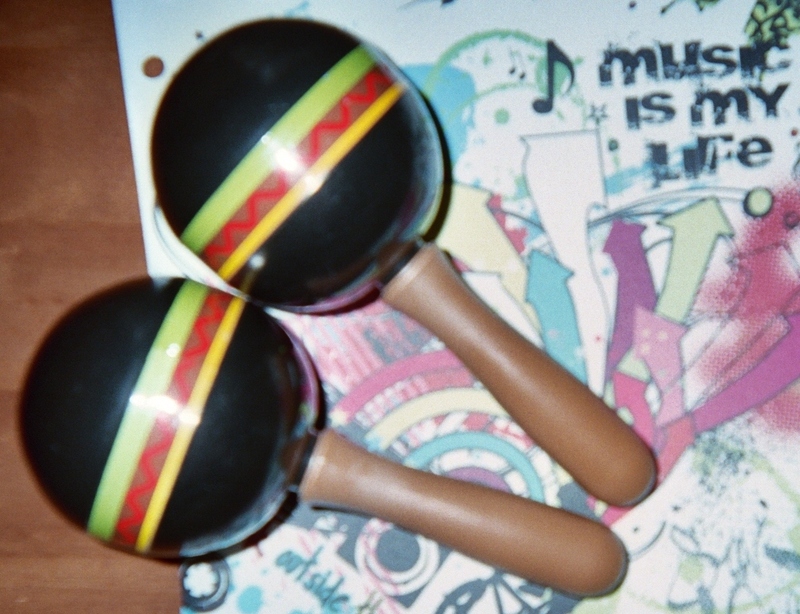 It’s quick…in a second’s time you can pick up two MARACAS like the ones in my blog pic here. one in my blog pic, but you can adapt this concept to suit a bag that you do find or already have. Any bag with an obvious visual theme will do. 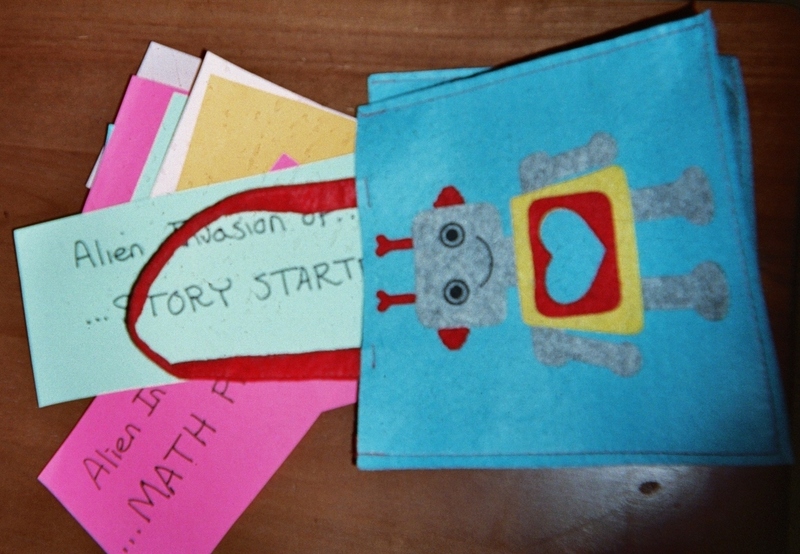 As you can see, I’ve used this bag as a holder of Story-Starter Cards that kids can pick. Any eye-catching bag can also hold cards of Extra Credit Math Problems for students to solve or some other set of instructional activity cards. A compliment chain is a clever incentive. each time her class receives a compliment from another teacher or school administrator (someone outside her own classroom). The teacher writes the compliment the class received on the paper link before attaching it to the chain. When the paper chain reaches the classroom floor the teacher gives her students some kind of reward, like a pizza party at lunch time. Another application of a PAPER COMPLIMENT CHAIN could be to hang one up toward the end of a school term to mark the accomplishments of your class. 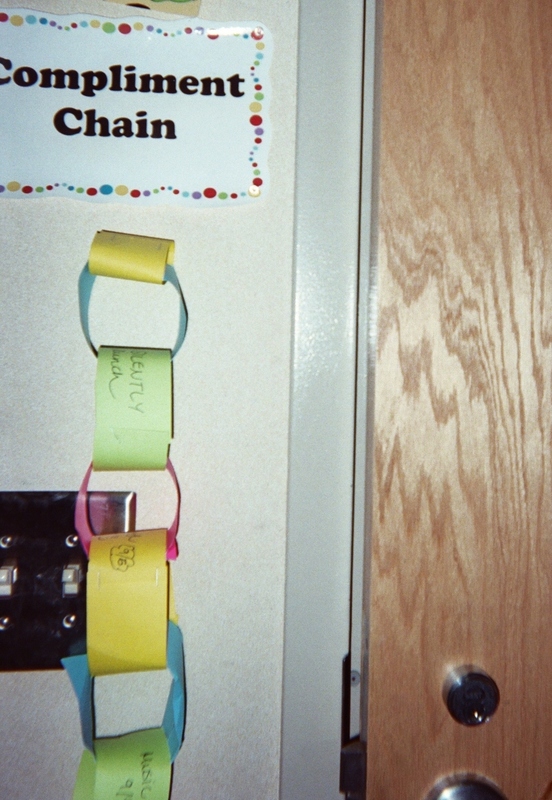 You might color-code the chain, using yellow links for example, to write your own “teacher compliments” to the class. Attach your links to green strips on which students have written favorable comments about their experiences with you. This application has the potential of offering constructive student feedback as you plan for teaching the next term. ‹ Engage Reluctant Writers – Write Out LOUD! 3 Pings/Trackbacks for "Use Cheap Attention Tools and Tricks"